After the great fun we had with the Berlin posse from Tresor, this time Kozzmozz invites some old and new friends from Holland. First up is Speedy J aka Jochem Paap from Rotterdam who’s always been a step ahead of other techno producers with several groundbreaking albums. A couple of years ago came his last outing ‘Loudboxer’ which was more dance-floor friendly then anything he had done before. He toured the world live not only solo but also with Chris Liebing as Collabs3000 after a very successful series of Collabs Ep’s and album on Novamute. He also made a dvd-project with American filmmaker Scott Pagano and is currently working on new tracks as well as a new label. 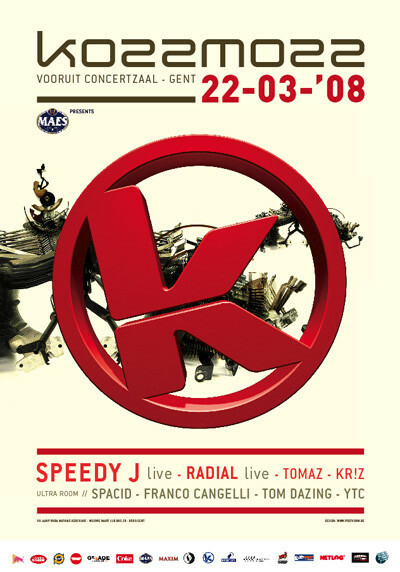 Speedy J’s live-sets are known to be the most energetic and legendary around with always very special set-ups. Also from Holland but quite a bit younger are Jeroen Liebregts and Laurens van der Starre who form the Radial crew. Next to their own label Audio Assault, you can also find them on labels as Planet Rhythm, Mote revolver, Numb and PVC. More recently they appeared on our resident Kr!z’ Token Records. Kr!z is one of those few dj’s who possesses the gift to play great records and have an astonishing mixing technique. And there’s more: Kr!z runs his own label Token records, with releases from Inigo Kennedy, Sub Space (aka Julien and Gonzague) and Radial that have all received raving reviews ! Tomaz from Studio Brussels Switch doesn’t really need an introduction. He’s been playing on all big and small events in Belgium and abroad and keeps us in touch with all the newest techno and minimal releases around on a weekly basis. And rest assured, his full on techno selection will surely fit the Kozzmozz crowd ! And we thought, we’d add an extra treat to the festivities so you can also get a taste of our newest Ultra concept with an Ultra room. The better minimal sounds of the moment, brought to you by Belgian dj’s who are making quite a name for themselves. Tom Dazing’s latest output on the German Heimatmelodie label is being played by Richie Hawtin himself and his latest release on MB Selektions is remixed by Someone Else ! Franco Cangelli has just released the Highway EP on his label Aesthetik Records with a Reynolds remix and more material from his is to be expected on Ferox and Seventh Sign.